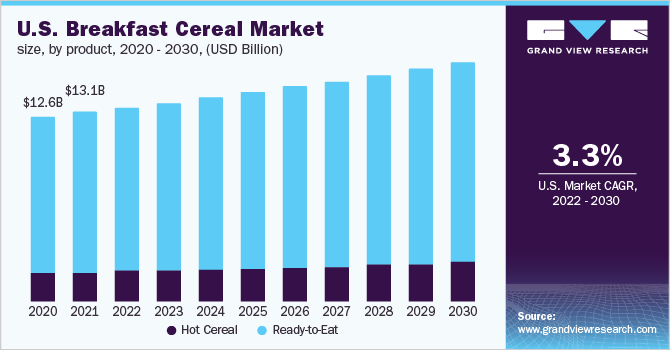 The global breakfast cereal market size is expected to reach USD 54.31 billion by 2025, according to a report by Grand View Research, Inc., progressing at a CAGR of 4.3% during the forecast period. Growing adoption of convenience foods and rising health consciousness are likely to augment the demand for breakfast cereals over the forecast period. Based on a report published by Grand View Research, Inc.; the global breakfast cereal market is projected to reach a valuation of around USD 54.31 billion by 2025. It is anticipated to progress at a CAGR of around 4.3% over the forecast period (2014 to 2025). Growing health consciousness, consumption of convenience foods, and purchasing power of consumers can propel market in the forthcoming years. Advancements in food retail infrastructure and increasing awareness regarding consumption of grain-based breakfasts can support growth of the market for breakfast cereals in the coming years. Rising demand for on-the-go breakfast options such as cereal bars and biscuits is expected to further drive demand. Consumers are focused on controlling calorie intake by reducing portion size and adopting cereals instead of traditional options. This factor is anticipated to bode well for product demand. Furthermore, increasing vegetarianism is also expected to spur market expansion in the forthcoming years. However, availability of alternative breakfast options is likely to restrict growth of the market for breakfast cereals over the forecast period. Most consumers prefer smoothies, frozen waffles, eggs, puddings, sausage, yogurt, and other healthy and traditional breakfast options. This factor may hinder adoption of cereals. In addition, easy availability of convenient and affordable nutritional meals is expected to hinder demand. The worldwide breakfast cereal market can be segmented on the basis of product, distribution, and region. Based on product, the market can be bifurcated into ready-to-eat (RTE) and hot cereals. In 2016, ready to eat led the market with over 68.0% total revenue share. The segment is expected to expand at a CAGR of 3.8% in terms of revenue during the forecast period. Growing awareness about fast, easy, and affordable meal options is likely to boost the demand. Growing adoption of on-the-go meal options has increased consumption breakfast cereal bars and biscuits. As per distribution channel, the market can be categorized into supermarket, convenience stores, e-commerce, and others. In 2016, supermarket was the leading segment and is anticipated to maintain its dominance through 2025. This growth can be accredited to rising number of supermarkets across the world. E-commerce is anticipated to emerge as a significant distribution channel. The segment is projected to hold a sizable revenue share owing to growth in developed countries from Europe and North America. Increasing use of internet and mobile phones in developed countries is anticipated to bode well for the segment growth in near future. Online channels offer better access to branded merchandise and customized shopping experience for buyers. Geographically, the market can be divided into North America, Europe, Asia Pacific, Central and South America, and Middle East and Africa. In 2016, North America dominated the global market followed by Europe. Factors such as increasing health consciousness coupled with health complaints like digestive ailments, obesity, and diabetes are expected to boost regional market growth. In addition, product innovations and advancements in packaging are expected to propel demand for breakfast cereals over the forecast period. Asia Pacific is expected to showcase the highest CAGR of around 7.0% in terms of revenue over the forecast period. Factors such as increasing elderly population, health consciousness, and changing lifestyle are anticipated to bode well for regional market. Rise in disposable income and developing healthcare infrastructure in countries such as Malaysia, India, and China are expected to boost product demand. Rising preference for convenience food due to busy lifestyle and western influence on food habits can further boost regional market in near future. 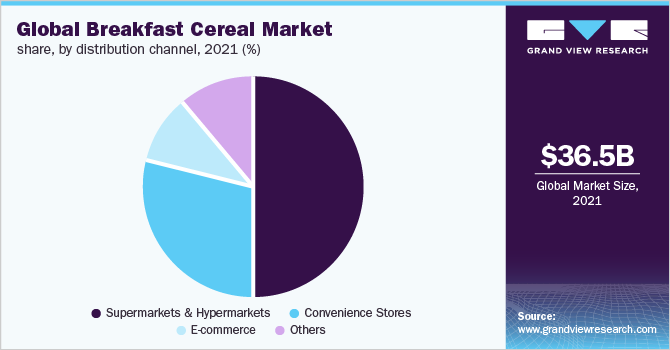 Key companies operating in the breakfast cereal market include General Mills, Inc.; Pepsico, Inc.; B&G Foods Inc.; Nestlé S.A.; and Marico Limited. Leading companies focus on areas such as portion sizing, product reformulation, and consumer messaging. They are also trying to introduce innovative fiber-rich, fruit flavored, and low fat products. Emphasis is being given on region-specific breakfast habits to attract more consumers. Moreover, manufacturers are implementing new technologies to improve product shelf life. Advanced enzyme technologies and bioprocessing along with high-pressure processing are adopted for improving quality, safety, and nutritional traits of oat-based foods.